Cather was the subject of many articles, and in them she often described her views on art, her writing processes, and influences on her work. She also made informal statements in the form of letters to editors, and gave speeches which were written up or summarized in newspapers in many parts of the country. 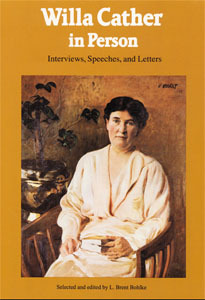 These pieces were collected by L. Brent Bohlke in Willa Cather in Person: Interviews, Speeches, and Letters (Lincoln: University of Nebraska Press, 1986) and are included in their entirety here.